So, while I didn't make this today, or even all that recently... I figured I'd make the first recipe post one of my favorites. 1. Prepare your chicken, garlic and onions according to directions. 2. Preheat a large sauté pan with square edges or a large stock pot (anything with a large base that’ll hold a reasonable amount of 3. liquid will work) to medium-high heat. 4. Add the vegetable oil to the hot pan, swirl until it “ripples” to let you know it’s hot. 5. Add the curry paste to the oil and stir with the prepared lemongrass- continue for about 2 minutes. Leave the lemongrass in the pan. 6. Drop the heat to a medium heat; add the chicken, garlic cloves and onions to the pan. 7. Stir the contents of the pan until everything’s nicely coated with green paste and the chicken starts to turn white. 8. At this stage, if you’re using chicken stock powder, sprinkle it over the contents of the pan. If not, skip this step. 9. 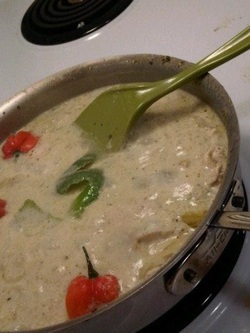 Add the coconut milk + chicken stock (or water), lime zest peel and chilies to the pan and stir until everything’s well mixed- i.e. no chicken is bare and there are no chicken stock clumps. Green stuff floating to the top of the pan is normal. 10. Reduce the heat to a low-medium heat and let simmer (uncovered) for about 45 minutes to an hour- until the chicken is tender. 12. 5 minutes before serving, add the vegetables and season to taste with salt. The sauce should be fairly runny, if it’s thick add more water. It will thicken as it cools down. 13. Once the vegetables are cooked to al dente, remove from heat. Garnish with fresh lime juice, sliced scallions, crushed cashews or whatever you feel like really. I generally eat mine with rice. Makes 4 servings, pair with rice and beer or a sweeter Riesling. * To prepare lemongrass for use in Thai cooking, cut both the woody, dry green ends and the root off. This should leave you with about 6 – 8 inches of pale lemongrass. Remove the outer two leaves, and cut two long slits from the base of the root end to about 4 inches below the top of the green end… kind of like you’re making a broom out of lemongrass. Then, take the back of your knife (or a rolling pin) and hit the cut ends a dozen or so times. You’ll immediately notice a difference in the smell.